Three Corner Vase – Cam Cosford | South Auckland Woodturners Guild Inc.
Cam Cosford was the last in line for this term’s “make-something-out -of -a -125- mm block” theme and he did not disappoint. Starting with a 100 mm cube of purple-heart Cam had skilfully laminated on three sides a 5 mm strip of white maple, sandwiched between the purple-heart block and a 20 mm strip of rosewood. The corners were carefully mitred and the block was a thing of beauty on its own before Cam began working on it. In answer to questions from the floor Cam explained that he used a drop saw to cut the pieces, including the mitre joints, and Titebond to glue them together. Firmly clamped of course. First step was to turn a spigot on the headstock end of the block, held by jam chucks between the main chuck and live centre, and using a bowl gouge for most of the shaping. Make sure the piece is marked so that it can be remounted in exactly the same position. Using a high r.p.m. Cam made the first cuts into the top third (nearest headstock) of the block to fashion the spigot. Keep moving the tool rest so that it is always as close as possible to the work to prevent “chatter”. 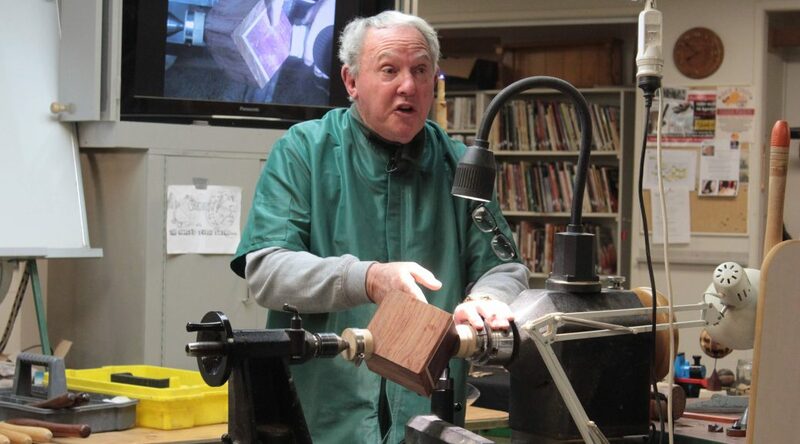 Once the spigot has been made the block is removed and remounted in the chuck (using the aforementioned mark). Now the tailstock end of the block is shaped to a flat surface so that the live centre can be brought up to the block with the jam chucks now discarded. Now another spigot is formed at that end (45 mm for a 50 mm chuck). When completed the block can later be held each end by chucks. At this point Cam began shaping the main body of the vase, always keeping the work firmly held each end. As the three “wings” of the vase begin to appear, more care has to be taken to avoid them catching stray fingers. Once remounted in another chuck at the tailstock end it may be necessary to make slight adjustments to ensure the lamination patterns appear evenly around the vase. Final exterior smoothing is done with a curved scraper. 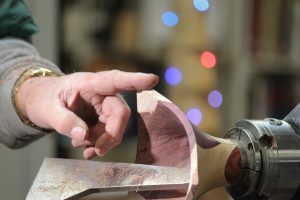 When completed the piece is turned around with the narrow end of the vase at the headstock end so that hollowing can begin. First the spigot is cleaned off and then normal bowl hollowing and smoothing takes place. Watch fingers with those flying vase “wings”! 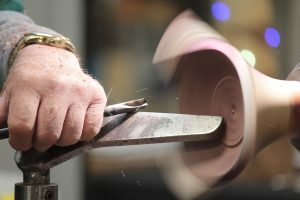 As hollowing proceeds, care is needed to ensure the bowl thickness is evenly distributed to conform to the outer curve. Use the callipers. Nice work Cam and another great learning experience for most of us amateurs! For those wanting to work with laminations using exotic timbers, the best suppliers are Rosenfeld Kidson and Timspec Timbers.